Giving praise to God, news from India is that my wife, Sylvia, gave birth to a boy child, and we thank you for your precious prayers. A few months ago we ministered to the Coimbatore district of Tamilnadu. As a team, we went to two villages. To reach three more villages, we had to walk and cross four mountains. There is no transportation or communication, and the trip was very dangerous � a mountainous area with many wild animals. But God saw us reach the village safely, and there we shared the Gospel with people and also provided clothing, rice, medicine and snacks. They were very happy, and many accepted Jesus Christ as their Savior. We ask that you pray for the villagers who are illiterate, and many are suffering from diseases such as chickenkunya, malaria and typhoid. We provided some medicine and antibiotics, but your prayers are also needed, as are volunteers and missionaries for the tribal ministries. My vision and aim is to visit many villages, sharing the Gospel of the Lord and tending to basic needs of the people. We also want to post volunteers to each as a missionary and to support the missions. Currently our team is made up of around 20 dedicated youths who are ready to do mission works. 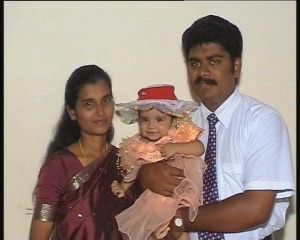 Congratulations to you, Prasanna and Sylvia, on the birth of your baby boy! Send us a photo soon, and let us know his name.